KENT, United Kingdom – After recently investing heavily in HARMAN's Soundcraft Vi platform, Mark Chant's Kent-based Phonophobia has now added a next-generation Soundcraft Vi3000 digital console to its inventory. The console was sold through Sound Technology Ltd., HARMAN's UK and ROI distributor. "Having MADI and Dante built into this desk gives Soundcraft a massive advantage as does the additional functionality, with the local ins and outs on the board," Chant observed. 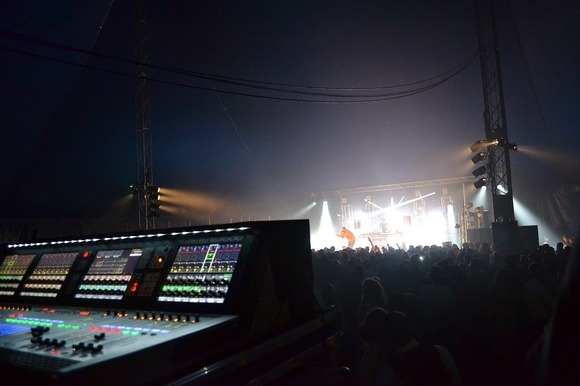 The Vi3000's first high-profile appearance was at a University of Kent Summer Ball in Canterbury, attended by around 4,000 students and headlining Ella Eyre, supported by several DJs. Phonophobia's Vi1 was down at the stage and the company also brought its Vi rack, running 60 inputs over 30 outputs. "Visiting engineers patched in through Dante or MADI, and since we have a lot of riders now showing Vi1 or Vi6, most seemed excited to be using the new desk," Chant added. "They turned up with their show files and used the Universal Audio plugins. "Although it was a stressful gig, none of my headaches came from the console - we could leave it and just walk away from it," Chant said. Summing up, Chant said, "This feels like a Vi desk — but is vastly superior, and the Vi3000 will be out constantly. Since we have advertised it on our website, we have received a steady flow of inquiries and the interest has been incredible." For more information on Phonophobia, please visit www.phonophobia-online.co.uk. For more information on Sound Technology, please visit www.soundtech.co.uk.